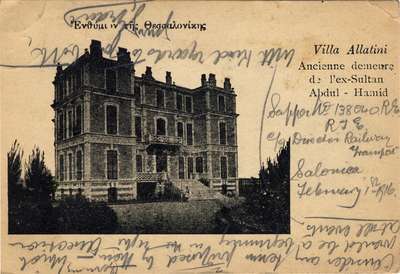 A postcard of the Villa Allatini in Salonica, Greece. It was built in 1888 by the Italian architect Vitaliano Pozelli as the summer residence of the Jewish Allatini family. Between 1909 and 1912 it was used as the prison-residence of Sultan Abdul Hammid II, who was overturned by the New Turks. "I am sending you this in the spare time I have as the result of an injury I received to my chest the other day while ..ding on the end door of a Motor Transport lorry. It is not serious, but causes some pain and incapacitates me for the time being. consider any terms proposed by them (Germany) -- which would be a beginning in the right direction at all events. Sapper No. 138040 RE., R.T.E. c/o Director Railway Transport, Salonica"